Eiji Aonuma, the Nintendo developer who inherited The Legend Of Zelda series from creator Shigeru Miyamoto, has expressed interest in shaking up the series’ formula for years. Today, during Nintendo’s “E3 Digital Event” livestream, he gave a brief glimpse of the new Zelda that’s in development for the Wii U, and from what he had to say, it certainly sounds different. Though not much was actually shown, Aonuma alluded to the upcoming sequel being an open-world game, a la Skyrim, where the player is free to roam without the set sequence that most Zeldas have enforced. 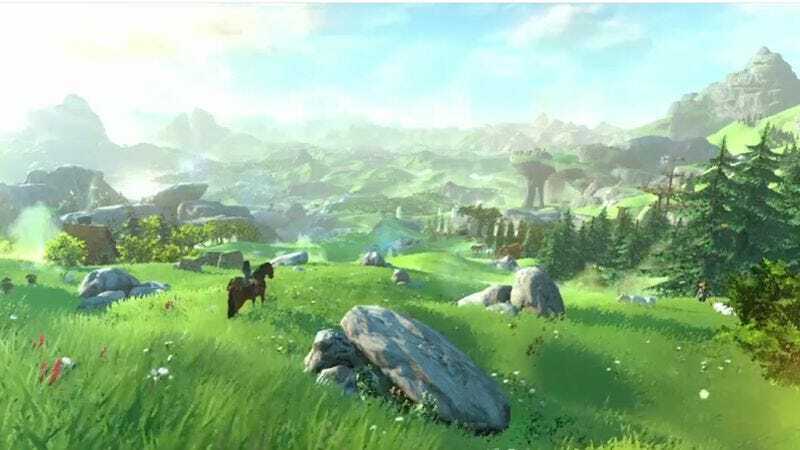 “Puzzle-solving in this game begins the moment the player starts to think about where they want to go, how they will get there, and what they will do when they arrive,” Aonuma said while footage played behind him of Link and his horse standing on the outskirts of a vast landscape. He even went so far as to use the now-cliché “You see those mountains in the background of this image? You could even get there if you walked far enough” line. The peaceful scene was then interrupted by some sort of walking laser tank machine that chased Link and set a bunch of stuff on fire. The cinematic encounter offers a look at the game’s art style—a more flat-shaded, anime-inspired look—but there are few other details to glean here aside from a projected 2015 release date. Hopefully one more Zelda tradition this new game breaks is long release delays, but something tells me Nintendo’s not ready to let that one go just yet.